Ryan Murray was quoted by the Columbus Dispatch as saying 'preseason is a grain of sand'. Lot's of perspective for a young guy, and I am impressed with his thoughtfulness. The time for false impressions is done, and the time for the real deal is upon us, and I can hardly wait. The Rangers struck gold when they got Alain Vigneault as Head Coach from Vancouver, and he has a vision for how he wants his team to play, emphasizing its speed. The CBJ have their own speed, but play a different game. Tomorrow night is the start of a good old Metropolitan division slugging match right out of the gate, and both teams will have a lot at stake. We will learn a lot about our team pretty quickly this weekend, with 3 games in 4 days. 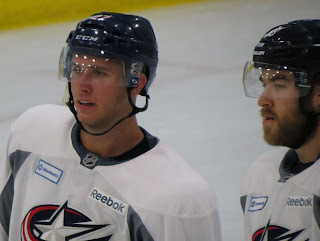 The CBJ have done the work this preseason and have done a lot of things that should help them start quickly. This is a product of stability in the organization and in the coaching ranks. Todd Richards has never shown a shyness about manipulating his line combinations, but he steadfastly left lines together all through preseason. That may change at the drop of the puck, or the first time they are trailing 2-0, but the impression I got from players comments about Richards is that he will ride a hot hand, and some of our players who have been pushed down to lower line situations find that a source of comfort. Personally I think he may try to stick with those line combinations longer this year than he has in past years, seeking chemistry through stability. For a long time fan, this is quite a different preseason. Things look as good as they have ever looked. But this team has doubters. Ryan Lambert over on Puck Daddy picked the CBJ as the 'most over hyped team', thinks little of the players on this team (Foligno will regress hard, Dubinsky an average, over rated player, no defense). Lambert has been hard on the Jackets over the years, and I haven't always liked what he has said. But since I'm a guy who drank a lot of Doug MacLean's Kool-aid, he's probably got more credibility. And truthfully, he's been right more often than I have, so I hope no one thinks this is some kind of rip job. But taking into account my fan-boy loyalty (not John Kemp loyalty, but it's up there), there are some things that you won't see unless you are really familiar with this team. A foundational concept held by the doubters, is that Nick Foligno is going to regress hard. He had a career year last year, and the stats geeks just look at his past performance and think it is a fluke. But one of the primary things about Nick last year was that his usage as a player was quite different than earlier in his career. Last year he played big minutes on the first line, whereas earlier in his career he was a third liner. His opportunities grew, and likewise his production grew. He seems slated to continue in that role this year, so while I don't think he'll score as many goals as he did last year, it won't be drastically different. So, there it is. The season is upon us, and it won't be speculation any longer. We'll have real hockey to write about. Enjoy the season everyone. It looks like this could be fun. I would not argue that point. But he also started playing top line minutes about that time, and that is different than his early career statistics, which was my point. Thanks for reading!